What are some good companion veggies/flowers/herbs to scare off beetles? 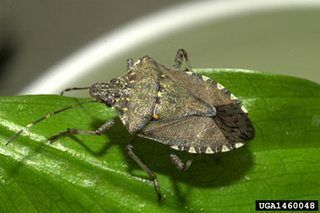 I've had the biggest problems with Asian Stink Bugs (an invasive species that is terrorizing the Midatlantic USA region) and Asparagus Beetles. 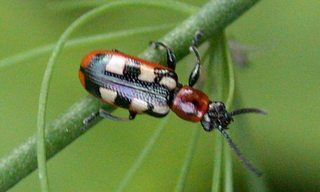 Oddly enough the asparagus beetles (right pic) are mostly found on my radishes, turnips and brassica, and only occasionally on my (young) asparagus. The stink bugs (left pic) are the worst, since the birds won't even eat them. I've been hand picking and squishing them all, and I've occasionally used neem. But I'd prefer to scare them away or confuse them with some flowers or herbs so fewer of them will show up in the first place. Any suggestions? Basil, Calendula, Nasturtium, Parsley, Petunia, Tansy, Tomato, and marigolds are all good at preventing bugs and especially the asparagus beetle. Companion planting of flowers and herbs with your veggies will make a big difference! Good luck! Marigolds are the standard repellent for both of these insects. I plant marigolds all over my garden, particularly around my tomatoes and asparagus. You can also try catnip or mint, although you need to be careful because mint has a pretty aggressive root system and can take over anything you plant it in. I put mint in a medium sized pot near my raised beds so I can contain it. I still have to check the plants each day and do some squishing, but it is getting less and less. Not the answer you're looking for? Browse other questions tagged pest-control herbs flowers companion-planting or ask your own question. What is the best way to grow vegetables without using chemical insecticide? What are some herbs and spices that are easy to grow indoors? What are some good herbs to grow (pair) with tomatoes? What are some good plants to put in a guild built around plums/stone fruit? What is a good companion for asparagus? What's the best way to kill cucumber beetles after I've started harvesting? What combination of herbs are good to plant in the same window box? How should I remove the wild greenery in my pots before transplanting flowers or herbs? What companion plants will help the growth of young pines?